The year 2018 ushers in the 70thanniversary of the Contemporary Arts Museum Houston (CAMH), the second-oldest non-collecting contemporary arts institution in the United States. Although the name and location of the museum have shifted since its 1948 formation, CAMH’s commitment to presenting cutting edge art of its time has remained steadfast. In particular, the institution has continued to celebrate works beyond the traditional scope of visual arts, showcasing design, music, dance, and literary traditions alongside the plastic arts. The exhibition revisits CAMH’s 70-year performative legacy of live arts by mining selected performance documentation and related ephemera from its rich archives. Stage Environment is curated by Patricia Restrepo, Exhibitions Manager and Assistant Curator. Founded in 1948 as the Contemporary Arts Association, CAMH has had a palpable focus on embodied presence within the museum from its inception. For example, the museum presented early collaborative productions with theater companies in conjunction with its 1949 exhibition Elements of Stage Design. 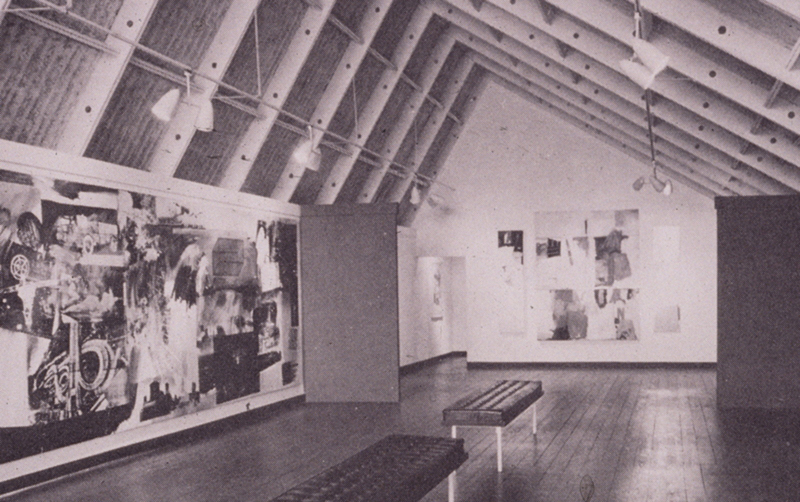 CAMH’s 1965 exhibition Robert Rauschenberg presented five works from the artist’s Combineseries alongside the thirty-two-foot long, silk-screened canvas Barge, which had rarely been exhibited before. The exhibition was augmented by a Merce Cunningham Dance Company performance of Suite for Five in April 1965, using costumes and sets designed by Rauschenberg, as well as music composed by John Cage; this performance marked the company’s first appearance in Houston. CAMH also sponsored Cage’s visit to Houston for a lecture about his music at a time when he was relatively unknown. In the fall of 1973, CAMH—in cooperation with the Institute for the Arts at Rice University, Houston, Texas—sponsored a series of concerts, performances, and new films in conjunction with its exhibition RE:Vision. Artists involved in this series included Philip Glass and the Ensemble, Richard Landry, Yvonne Rainer, and Jon Gibson. This live arts programming marked the first time each of these individuals performed in Houston. A notable performance of Terry Allen’s Juarez Serieswas presented at CAMH in 1975. Paul G. Schimmel, then CAMH’s Senior Curator, included performances by Laurie Anderson, Eleanor Antin, Bill Leavitt, and Roger Welch in his widely-toured 1977 exhibition American Narrative/Story Art 1967-1977. Eleanor Antin returned to the museum for a subsequent exhibition in 1981 entitled Other Realties—Installations for Performance, which included a new Antin performance. Other Realties continued the conversation RE:Vision had started; it featured performance work by Vito Acconci, Colette, Tina Girouard, Joan Jonas, and Robert Wilson. Stage Environment plans to present documentation of these historical works; although this is no replacement for seeing the live bodies in the space, it will provide a sense of how much history has transpired between the museum’s metal walls. Stage Environment is not the first exhibition the Museum has organized to explore its institutional history. In 1982, CAMH mounted a 34-year review of its fascinating and significant history in the exhibition In Our Time. In 1997, this institutional record was investigated and updated in Finders / Keepers. Stage Environment celebrates not only CAMH’s live arts history but also its robust archival collection, which was donated to Rice University’s Woodson Research Center in the Fondren Library in 2017. This donation allows CAMH’s archival holdings to be available and searchable by the general public and scholars alike. The Woodson Research Center also has been able to conserve and transfer analog performance documentation to searchable digital formats, including the materials shown in Stage Environment. Sebastian J. Adler as quoted in “Birkerts May Set Precedent in Museum Construction,” Houston Chronicle, July 9, 1969. Stage Environment: You Didn’t Have to Be There is curated by Patricia Restrepo, Assistant Curator and Exhibition Manager. CAMH is wheelchair accessible. Exhibition labels are available in English, Spanish, and large print at the front desk.